The Minnesota Department of Employment and Economic Development identifies LPNs as the state’s eighth-most in-demand profession – with 3,240 job openings expected to be added from 2012 to 2022. To accommodate the growing need for qualified practical nurses, the state’s regulating board has approved a large quantity of LPN programs throughout Minnesota. The majority of these can be completed in a year or less, making the barrier to entry to this profession minimal. Keep reading to explore and compare Minnesota LPN schools, learn what it takes to become licensed in this state, and view the latest LPN salary and employment trends. Campus-based LPN programs can be found from Rochester to Minneapolis to Thief River Falls. 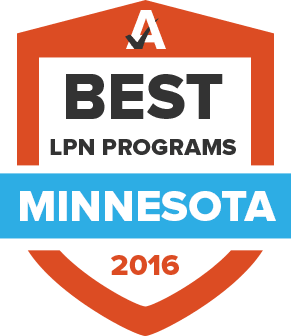 And with the added availability of online programs, LPN training can be completed just about anywhere in Minnesota. Prospective students can use this side-by-side comparison tool to make an informed decision about where to attend nursing school. Licensed practical nurses are tasked with providing patients with crucial care in a variety of settings, requiring them to be dedicated and knowledgeable professionals at all times. In order to ensure only the best and brightest are working in the field, the Minnesota Board of Nursing developed a set of requirements all candidates must fulfill before being licensed. All applicants for practical nursing licensure must first show they’ve successfully completed an LPN training program. This is done by having the educational institution send official transcripts and a Confirmation of Program Completion form to the Minnesota Board of Nursing. After these have been received, candidates are eligible to register with their nearest Pearson Vue testing center to take the NCLEX. They will then receive an Authorization to Test notice, at which point they have a 90-day window to take the examination. Students should note that a $105 fee will be due when the licensure application is submitted. If they are successful, candidates will receive their license within 10 days of passing the NCLEX. LPNs in Minnesota must renew their licenses every two years by filling out an application, either online or on paper. Within this application, they must also include an affirming statement showing the mandated continuing education credits completed since the last renewal. When submitting a renewal application, candidates must include an $85 renewal fee. Although LPNs in metropolitan areas can expect to make more than their rural counterparts, LPNs as a whole earn comfortable annual wages in Minnesota. Aside from location, the biggest factor affecting salaries is level of experience. The following tables highlight both of these variables to help new and experienced LPNs better understand their earning potential. Minnesota offers LPNs ample choice for where to base their careers. While the state as a whole is projected to experience significant growth of LPN roles, the following table highlights the regions set to see the highest rates of expansion. Council 65 serves as the voice of government-employed LPNs in Minnesota, helping ensure these professionals are treated fairly, receive ample wages, and have good working conditions. This list, compiled by the Minnesota Board of Nursing, provides students with plenty of options when it comes to selecting a state-approved practical nursing program. LPNs who have recently completed the NCLEX and submitted a licensure application can check the status of their case via the MBN portal. LPNs who were previously licensed in another state or territory will need to receive license by endorsement if they plan to work in Minnesota. The MBN provides an application and relevant guidelines for individuals following this path. The first stop for all LPN candidates, the MBN website provides information for licensees, applicants and the public, as well as details about upcoming public meetings. This professional organization serves as the official voice of LPNs in Minnesota, providing advocacy efforts, continuing education, meetings, and resources for members. Presented by the Office of Rural Health and Primary Care, this intensive report offers an in-depth profile of LPNs throughout the state, including data about location, work experience, demographics, and future plans. This large professional group offers a variety of services and support to its members throughout the state, including legislative representation on important nursing related-issues, updated reports up relevant news within the industry, and regular member meetings. Provided by the MN Board of Nursing, these requirements apply to all LPN candidates applying for licensure for the first time. Looking to ensure an LPN license is current? This website allows users to easily lookup an existing license to verify its validity.